Each day we are going to highlight one of the amazing research projects seeking funding in Round 4 of the #Scifund Challenge. Today we introduce David Pappano, who studies Geladas (a very social primate) social organization and behavior. He also is an open notebook scientist (author note: <3)! My name is David Pappano and I recently finished my Ph.D. from the University of Michigan-Ann Arbor. I am currently a postdoctoral research fellow in the Department of Ecology and Evolutionary Biology at Princeton University. I actually grew up in New Jersey not far from where I currently work. I am a primatologist by training—meaning I specialize in understanding the behavior, ecology, and evolution of monkeys and apes. My particular study species is the gelada (Theropithecus gelada), a species that is only found in the mountains of Ethiopia. One day I hope to blend research with teaching as a university professor, but for now I am focused on research full-time. Geladas live in a modular society where small “core groups” (containing females and a single breeding male) join up and split apart from each other to create herds of over 1000 monkeys. This is really strange, because most primates live in stable groups of about 50 individuals. During my dissertation research, I noticed that “all-male groups” (containing only adult bachelor males) influenced the spacing and grouping of core groups. Basically, as bachelors approached core groups, females within core groups would clump together. This is the exact same response you would expect if the bachelors were a predator, like a hyena or leopard. I reasoned that the unit males and females responded like this because bachelors are observed to kill offspring if they enter a unit. Although this was only a small part of my dissertation research, it spurred my interest in animal movement. 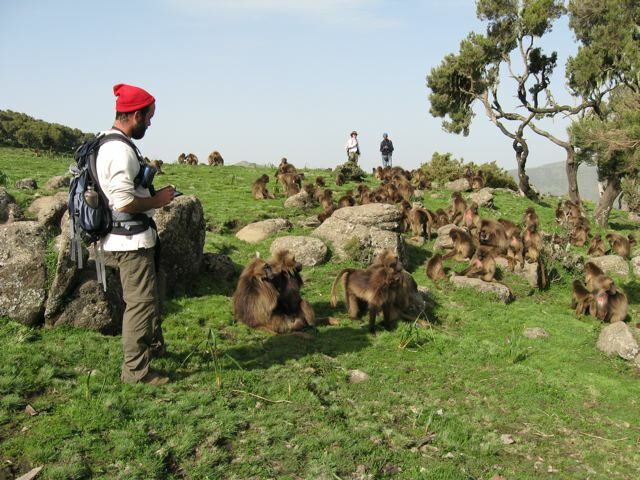 As a result, my current project focuses on how relationships among females within and between units influences collective movement of the entire gelada herd. For me, doing science is my lifestyle as much as it is my profession. I love collecting data, analyzing (and re-analyzing) data, and solving problems. My current project is very interdisciplinary and draws from biology, ecology, and computer science to understand complex patterns of movement and herding in geladas. You should fund this project if you love primates and innovate methods to understand complex behavior. This isn’t a “favorite” story, but it is a memorable one. In April 2011 I was wrapping up my field work on my dissertation research in Ethiopia. I travelled to the capital (Addis Ababa) to speak at a Youth Conference organized by the U.S. Embassy. A few days before the conference, I broke a molar in half (ouch!) while eating doro wat (a delicious chicken stew and national dish of Ethiopia). I had to get half my tooth pulled and capped in Ethiopia. Regrettably this fix didn’t hold and I had to go back to the U.S. a few weeks earlier than I expected. I never got to say goodbye to my field assistants and park rangers in the Simien Mountains National Park. I have yet to go back to Ethiopia, but if I get funded then I will be able to return. Why did you decide to particpate in the SciFund Challenge? Two months ago, I unsuccessfully tried to fund this project through a crowdfunding campaign. Although I was disheartened, I reasoned that I needed a bit more time to refine my project. After speaking with the organizers of SciFund, I decided to give it a second chance. Making the video was pretty tough. I’m not exactly Steven Spielberg. My favorite part of the process so far has been reading through everyone else’s projects. Everyone is doing such great work. It is really exciting to see such amazing work from concept to completion. I have an identical twin brother. He works in the financial industry in New York City. A few years ago, he wanted to try out for the Amazing Race. We made a video, but we (obviously) didn’t get selected. Maybe if the whole academic thing doesn’t work out we’ll try again. Previous Round 4 of #SciFund Launched!